The Edmund Stone name shows up in several regional history books, but little has been written about his Colorado life until his great granddaughter, Mary Tate, wrote a book about the Stone Family. Here is a summary of his life. Judge Edmund T. Stone and his wife Martha Riley Stone with their family moved to Colorado City in either 1863 or 1864. They were among the earliest Colorado City settlers. Before moving to Colorado, Stone had been a constable and probate judge in Haynesville, Missouri. His old title followed him to Colorado City where he was known as Judge Stone. In 1868 when the Arapahoe Indians attacked and killed Charlie Everhart and the Robbins Boys the Stones escaped uninjured. Although on that day the Judge and his sons Millard, and John rode out to rescue settlers who were threatened. Judge Edmund T. Stone was also one of the trustees of the Fountain College established by Professor Wray Beattie. It grew out of a Colorado City academy founded and conducted by Beattie. Besides Judge Stone and his Wife, the children, and their spouses were quite involved with Colorado City over the years. This is an 1886 picture of the final version of the Store that was started after Judge Edmund Stone came to Colorado City. From their beginning the Stone family lived on the same location as the store – which is today the northeast corner of 27th and West Colorado Avenue. The store was named, over the years, the Stone store, Stone & Hilficker Store, before being named the Faulkner Store. 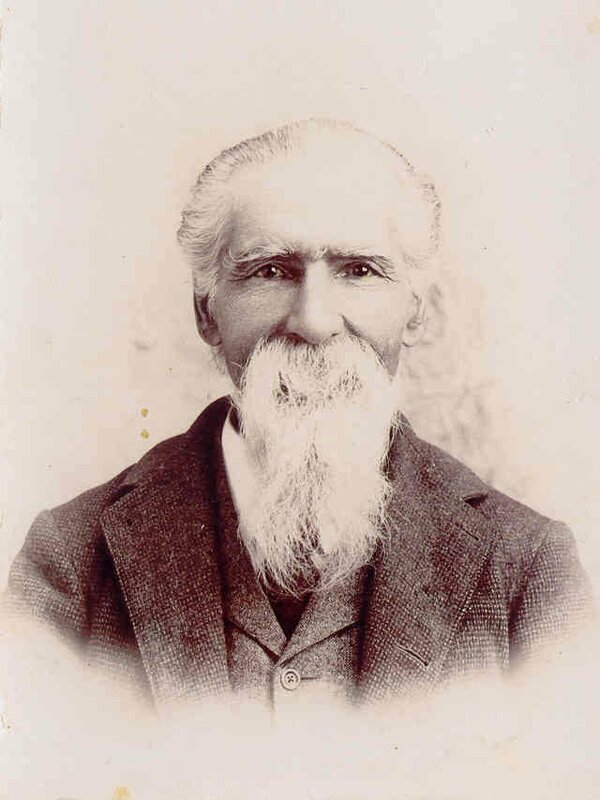 In 1878, the oldest son, Millard Stone, took over the store. He operated it as the Stone Grocery and Clothing Store after his parents moved to New Mexico. Following in his father's footsteps Millard became a Colorado City constable in 1873. This was mentioned in his obituary and at the same time, there was mention of his father. It read, "Judge E.T. Stone was one of the pioneer judges of Colorado and a prominent man in state and county affairs." Millard's sister, Mary Emma, became the first Post Mistress in Colorado City. After daughter Mary Emma married J.D. 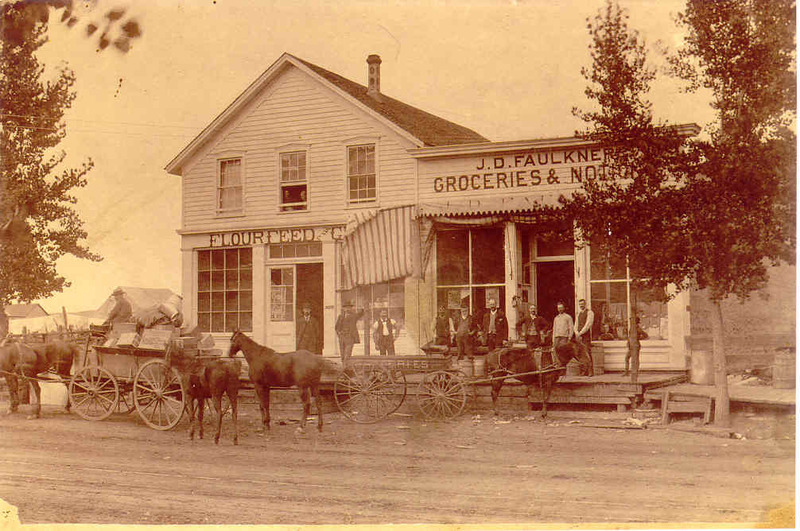 Faulkner in 1877 the store was named after her husband who had purchased it from Millard. The attached building was both a store and the Stone’s home. Millard moved to Cripple Creek in the 1890s after the gold strike boom there. The photograph shows the store had two large store fronts. It also had ample living quarters upstairs and to the back where Mary and James Faulkner raised their eight children. They lived there until the death of Mr. Faulkner in 1918. The family did not sell the store until around 1928. J.D. Faulkner became Mayor of Colorado City in the early 1890s. He followed Emma as the Postmaster. And after the store closed, he used the store for his law office and he became the Justice of the Peace of Colorado City. Judge Stone and his wife, Martha, and their two younger sons, John and Sterling, had moved to Roswell, New Mexico in 1878 where they lived an active and civic minded life for the rest of their lives. They are both buried in the South Cemetery in Roswell, New Mexico in the Stone family plot. Sterling and John and his wife, Fredonia, are also buried there. Millard and his wife, Genoa, are also buried in South Cemetery. Family information provided by Lifetime Society member Mary Tate, great granddaughter of Judge Stone and his Wife. One of the satisfactions we members of the Old Colorado City Historical Society get out of our Volunteer efforts comes from helping living descendents of Colorado City and El Paso County Pioneers find the evidence of the lives lived here by their long dead ancestors. This 2009 Sesquicentennial Year of Colorado City's Founding gave families, hitherto only connected to us via our Web site, and who live far away, the opportunity and excuse to travel to our Founders Day Celebration, and while here to get research help and guided tours by us to the places their forebearers lived, worked, and died in and around the original Colorado City. 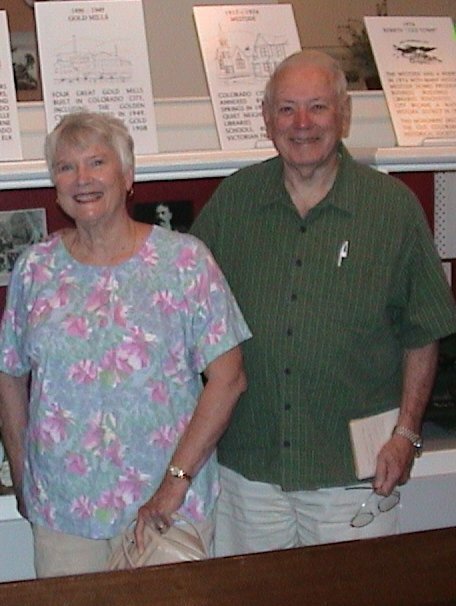 One such grateful family, Mary Tate and her husband Bob, drove all the way from Indiana so she, the Great Granddaughter of Judge Edmund Stone, could find the exact locations and perhaps still standing buildings he and his family lived and worked in after he came to Colorado City in 1864. And perhaps find where a tiny family baby was buried. Mary Tate had visited Colorado Springs in years past researching her kin, but she was frustrated by the inability of either Penrose Public library or the large Pioneer's Museum paid staff to help her locate any of the key locations important to her family. We came through for her. For our society and history center have so mastered the history of early El Paso County and the original Colorado City we can, and will, solely as unpaid volunteers, help do detective work and find historic homes and places. In turn, those decendents offer to us manuscripts, photographs, oral and video interviews, stories and letters about their ancestors. Their contributions become additions to our Archives, and are displayed on our always-changing Web site. We gather as much history via our Web site as we disseminate. We were able to drive Mary Tate on a Sunday right to the site of the long gone "Faulkner Store," which Judge Stone built, and where he lived, and raised his children. Then we took her right up the stairs of the still standing Templeton Building at 2502 West Colorado to where Judge Stone's son Millard's family lived in an small apartment while he opened a Dry Goods store downstairs in that Victorian building in 1891 soon after it was built. She had the name of the store and the year, but no address, old or new. Then we drove her right to the hard-to-find stone monument on the abandoned "Mesa cemetery" now called Pioneer Park where a child lies still beneath the grass in an unmarked grave. 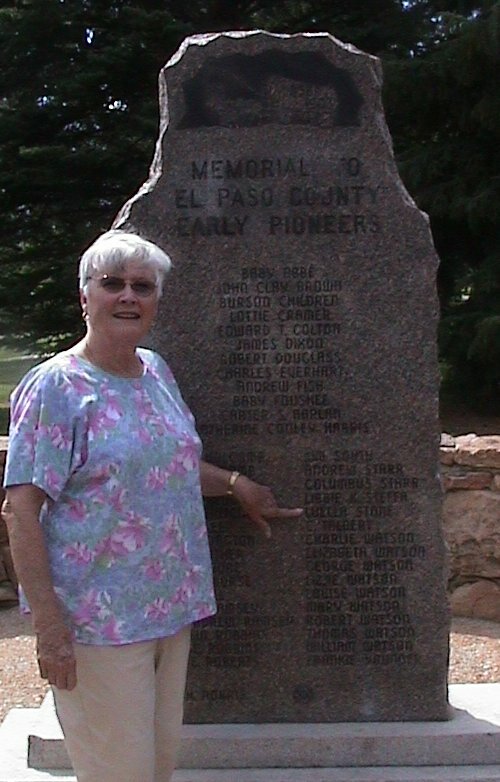 Mary was able to run her fingers over the engraved name "Louella Stone" beside the other 45 names put there in the 1950s by now deceased El Paso County Pioneer Association members. Judge Edmund T. Stone and his wife Martha Riley Stone with their family moved to Colorado City in 1864. They were among the earliest Colorado City settlers, building a store and home. Before moving to Colorado, Stone had been a constable and probate judge in Haynesville, Missouri. His old title followed him to Colorado City. The Stones had five children by the time they arrived in Colorado City. The sixth child was born to them in Colorado City but she died in infancy. They named her Louella. She was the one buried somewhere in Mesa Cemetery. In 1868 when the Arapahoe Indians attacked and killed Charlie Everhart and the Robbins Boys, the Stones escaped uninjured, although on that day the Judge and his sons Millard, and John rode out to defend settlers who were threatened. An 1881 History of Southern Colorado credits Judge E.T. Stone, by 1871 "...more than any other man," with getting the one horse-wide Ute Pass turned into a Wagon Road once and for all. Judge Edmund T. Stone was also one of the trustees of the brief Fountain College established by Professor Wray Beattie. It grew out of a Colorado City academy founded and conducted by Beattie. It did not last. Following in his father's footsteps the oldest son, Millard became a Colorado City constable in 1873. Millard's sister, Mary Emma, became the first Post Mistress in Colorado City. In 1878, Millard Stone, took over the store. He operated it as the Stone Grocery and Clothing Store after his parents moved to New Mexico. After daughter Mary Emma married J.D. Faulkner the store was named after her husband who purchased it from Millard. The attached building was both a store and the Stone's home. Millard moved to Cripple Creek in the 1890s after the gold strike boom there to try his luck. Which wasn't good, so he returned to Colorado City. The photograph shows the store had two large store fronts. It also had ample living quarters upstairs and to the back where Mary and James Faulkner raised their eight children. J.D. Faulkner became Mayor of Colorado City in the early 1890s. He followed Emma as the Postmaster. And after the store closed, he used the store for his law office and he became the Justice of the Peace of Colorado City. They lived there until the death of Mr. Faulkner in 1918. The family did not sell the store until around 1928. Millard, after coming back from Cripple Creek married, and opened a Dry Goods Store which had grown out of the Faulkner Store in the newly erected - 1891 - Templeton Building of Colorado City. His family lived in an apartment on the second floor of thatthree-story building - a twin to the Meadow Muffin building across the street. Those two buildings became virtually 'The Downtown Malls' and business center of then red brick Victorian era of Colorado City. Mary Tate was pleased that we actually could place her at the front door of where her ancestors both lived and worked over 100 years ago. Judge Stone and his wife Martha moved to Roswell, New Mexico in 1898 and lived there until they died. Mary Tate was grateful for our help. She became a lifetime member of our Historical Society, donated to the Sesquicentennial Monument, and left us a large manuscript that fleshes out the Judge Stone family story that is still largely untold. She will be an active, online Society Member for many years to come.